The dunes at Woonona beach during a storm. THE draft Dune Management Strategy for the patrolled swimming areas of 17 Beaches will go on public exhibition from Monday (June 17). Wollongong City Council’s strategy follows the release of a draft Coastal Zone Management Plan. During the consultation for this plan concern was raised over excessive dune heights and scarping of the frontal dunes after storms, and the type, height and extent of vegetation on the dunes and its impact on scarping and beach amenity. Council’s manager environment strategy and planning Renee Campbell said the strategy has provided a comprehensive study of the dunes and their role in maintaining beach stability and also their part in recreational amenity of these beaches. “The primary aim of the strategy is to identify management options for maintaining sightlines and recreational beach amenity in the vicinity of surf life saving clubs, while considering biodiversity values and the resilience of beaches to coastal hazards,” Ms Campbell said. “Council asked consultants with expertise in coastal management to prepare the draft strategy for the flagged swimming areas of the 17 patrolled beaches in the city. In preparing the strategy the consultants assessed three main areas of concern – sight lines, recreational amenity, and beach access and they identified issues relating to these concerns at eight beaches in the city. Two of those beaches – Towradgi and City Beach – were classified as having severe issues. The draft strategy also includes a list of proposed management options to deal with these issues. The draft strategy will now be placed on public exhibition until to July 14. All community members and beach goers are asked to view the draft strategy and make a submission on the proposed management options during this period. The draft strategy can be viewed on Council’s website and also through the Council’s libraries. For more information you can contact Council’s Customer Service Centre on (02) 4227 7111 or visit Council’s website. The Dune Management Strategy is very disappointing and a lost opportunity to restore the beaches as they should be. Not only will the amenity problems remain such as being unable to walk the beaches at high tides, the safety aspect of high 2-6 metre sand cliffs and steeper beaches which means deeper gutters just off shore will remain with no plans to prevent these dangerous features forming on 90% of our beaches. The last time I looked, the vegetation and dunes that are made up of locked up sand, trapped in the vegetation’s roots, covered the entire beach length where vegetation was planted. 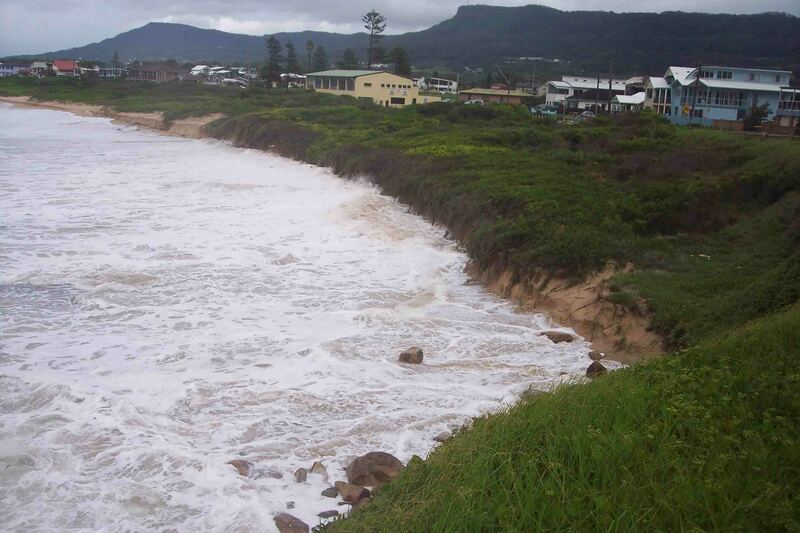 The study areas take in the patrolled areas only about 10% of the Illawarra’s vegetated beaches, neglecting areas where help is far away if someone should find themselves in trouble. It’s like someone with skin cancers all over the body, going to the skin doctor and the doctor saying, Ill just treat the cancers on your face and leave the rest. The study period undertaken by the consultants was only six months or so. This is totally inadequate as they didn’t even get to see all the vegetated beaches during storm events, especially throughout the winter months, when the problems are at their worst. Rather than ensuring the whole regions beaches are safe and accessible, this is a study that seems to be more focused on the vegetation staying on 90% of the regions vegetated beaches. Instead of solving the cause of the problem by removing the wrong vegetation species, from the wrong places, (according to a prominent expert on Wollongongs Beaches,) expensive options costing hundreds of thousands of dollars are tabled to accommodate the non -complying vegetation. There are many aspects of the workings of a beach, that the vegetation has interfered with, that are not even mentioned in this study. I believe there are some real problems that could surface if the proper workings of the beaches are not restored. Locking up sand on vegetated beaches could mean erosion will be worse at the northern ends of these beaches. This deprivation of sand at the northern ends of vegetated beaches, which is already happening at present, is a real concern. During a really extreme storm, these ends of the beaches could be very vulnerable. There are no studies in the strategy, on how vegetated beaches act over time, including the changes to the “sediment budget”, the distribution of sand along our coastline, caused by the vegetation. All of the studies mentioned in the strategy, on how beaches work, were done on beaches, before vegetation was planted. I hope I am wrong, but leaving the vegetation on 90% of the beach could be a big mistake.